BULLOUGH CUP - Commences Saturday 6th April 2019 - Please click here for notice information. Open to all male members of Clubs in C.A.G.U and Clubs who play mens matches against Links Golf Club. Also open to Links members. Open to all Junior golfer (Boys & Girls) with a handicap up to 54. Entrants must be under 18 on 1st January 2019. Please click here for Tee Times. 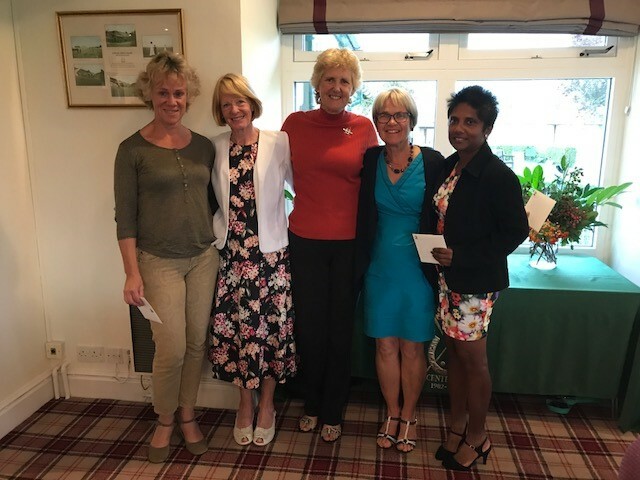 Another fabulously successful day at the Links Golf Club when 104 Ladies from 25 different clubs played in our Autumn Open on Tuesday 4th September. Both our Spring and Autumn Opens have been oversubscribed and we already have entries ready for next year. These events are only successful because of the fantastic contribution our ladies make in promoting, organising, baking and attending to our guests on the day. The popular team AM-AM format produced some great scoring with lots of fun and smiles along the way. The raffle took a profit of £257 for EACH our charity. Please click here to view Tee Times - I also sent through an email to the lead name on your entry form on 09-08-18 which I would be most grateful if you would read. The annual Links Senior Open was held on Wednesday 1st August in hot and sunny conditions. The 72 competitors from 30 different clubs produced some fantastic scores, in the 4BBB stableford competition. 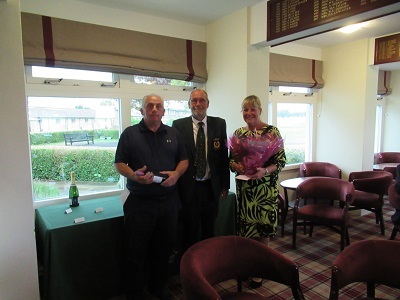 The winners were Terry Sambridge & Evan Kemp from Tydd St Giles & Heacham Manor with 45 pts. 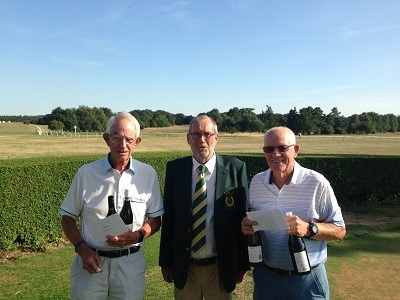 Chirs Flack and Gus Albon were runners up with 42 points on c/b and Alan Benton & John Gregory took third place. The winners complimented the club on a very successful day in their speech. 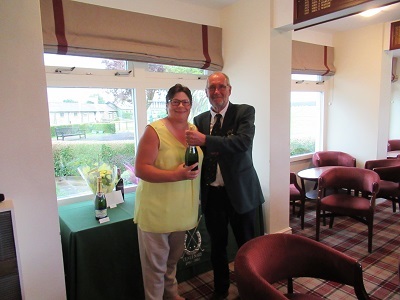 The annual Links Mixed Open was held on Thursday 24th May 2018. 18 different clubs took part producing some fantastic scores, in the 4BBB stableford competition. At the halfway house on offer was Prosecco and homemade nibbles. 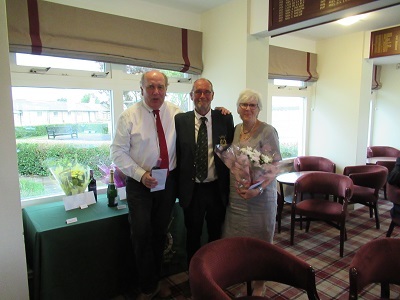 The winners were Mick Hewlett & Susan Bright from Brickendon Grange who scored 44 pts. 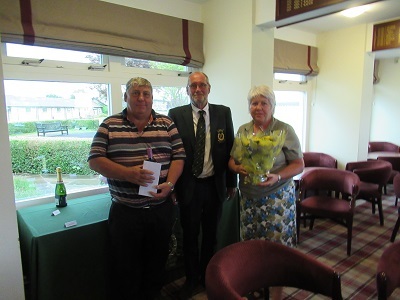 Alan & Trisha Davis of Lakeside Lodge were runners up with 42 points. 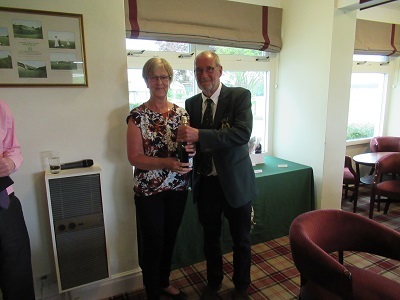 Tim Pitt & Judi Walker from Stowmarket & Eaton took third place with 41 points. After the match everyone enjoyed a meal of Roast Leg of Lamb and a selection of homemade desserts. The winners complimented the club on a successful day in their speech. …..and then the sun came out !! 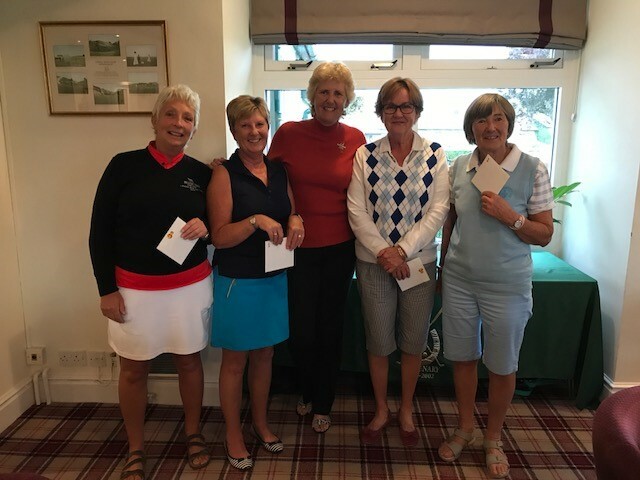 Another fabulously successful day at the Links Golf Club when 104 Ladies from 25 different clubs played in our ever popular Spring Open on Tuesday 17 April. The sun came out to greet them all, along with Linda from the pro-shop promoting the latest Spring/ Summer Ladies’ fashion collections. Mr Sharkey had a very big smile on his face at the end of the day so we can only assume that stocks are now low for Ladies' clothing. Both the Spring and Autumn Opens have been oversubscribed for sometime and we already have entries ready for next year. These events are only successful because of the fantastic contribution our Ladies make in promoting,organising, baking and attending to our guests on the day. A big thanks to Jude and Jane Duplock Clark for making the day happen along with great support from Amanda in the office. Thanks too to Marcella & Sarah Reardon on reception. Teresa Locke who managed to cajole £433 from our visitors for this years chosen Charity EACH. To our Half way house hostesses Edie Douglas, Jane Monk, Barbara Coe & Mary Walsh. A huge thank you to all our would be Bake Off Babes for some scrumptious nibbles and cakes and thye were. Barb. Pam Fitsall. Marcella . Pauline, Mary ,Val, Sue Harrison, Ann Jennings, Marian Earle, Naomi Barbara Marshall. Last but not least thank you Pauline Bond for doing a magnificent job on Pandoras Box and of course our fabulous Lady Captain for her wonderful flowers that graced the clubhouse . Nearest The Pin on all Par 3’s All won a sun visor with ball marker kindly donated by the Pro-Shop. What a fabulous day and lots of compliments from our visitors saying how much they enjoy visiting our club. Four teams have already got their names down for 2019. Open to all male members of Clubs in C.A.G.U and Clubs who play mens matches against Links Golf Club. Also open to Links members. Click here to view the poster. 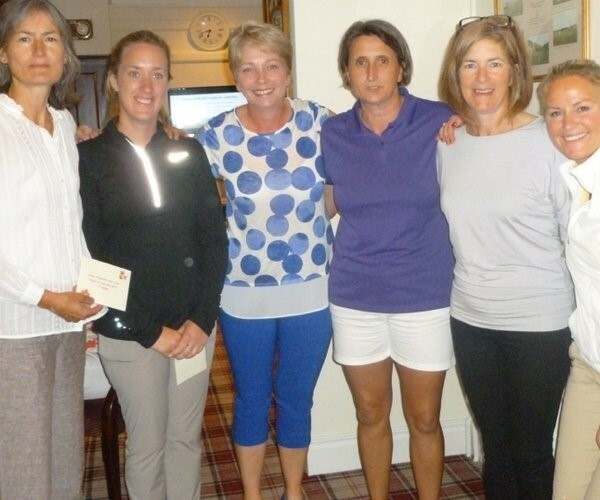 104 ladies from 30 clubs played in our Autumn Open this week. A fun team event played off 7/8th of handicap with the best 2 scores on the Par 4s and 5’s and 3 scores on the par 3s. Always a very popular day with visitors and the same ladies seem to come back again each year. Many thanks to Marcella Tuttle and Kirsty Guthrie who did a fantastic job organising the event. Kirsty who has never organised such a large event at the club did an amazing job and was “on it” the whole time! A real keeper! We owe a huge thank you to the army of helpers who turned up looking so smart in their club uniforms. Sarah Greenall, Sue Nicholas, Chris Camplin and Pauline Kennedy on the registration desk; Jane Clark for meeting and greeting; and Edie Douglas, Mary Petty, Hilary Radford and new member Di Taylor for serving the fantastic cakes and savouries in the halfway houses. And of course we can't forget the many bakers and chefs who made such fantastic cakes and savouries. No doubt some of the visitors only come to play for the food in our halfway houses! Many thanks also to our gentleman starters Hamish Fleming and John Tuttle who stood out in the rain for the first hour! The raffle took a profit of £300 for our selected charities The Pancreatic Research Fund and Prostate Cancer UK. It looks like the Pro Shop did some amazing business as most ladies were carrying bags of goodies! Many thanks also to John Sharkey for giving the four nearest the pin prizes which he very kindly donates each year for both our Opens. Everyone pulled together to make the day a huge success – a brilliant team effort. Thanks again to everyone who made the day so special. The annual Links Senior Open was held on Wednesday 2nd August in tricky windy conditions. This did not stop the 76 competitors from 27 different clubs producing some fantastic scores, in the 4BBB stableford competition. 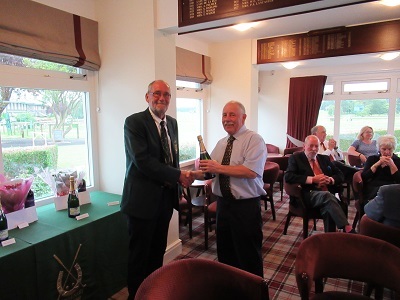 The winners were John Davison & David Norris from Bentley who scored 42 pts. 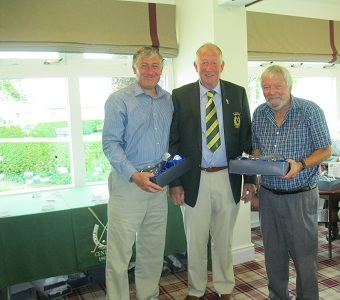 Geoffrey Edwards and Paul Harrison from Rookery Park were runners up with 41 points. Chris flack with his partner Robert Hynes from St Neots took third place with 39 points on c/b. The winners complimented the club on a successful day in their speech. 104 ladies from 26 clubs played in our Spring Open. A fun team event played off 7/8th of handicap with the best 2 scores on the par 4s and 5s and 3 scores on the par 3s. Always a very popular day with visitors and as always we were oversubscribed with a waiting list. Lesley Ellis and Jude Hole did a fantastic job organising the event. We owe a huge thank you to the army of helpers who turned up looking so smart in their club uniforms including Lesley McAllister, Karen Cook, Marcella Tuttle for registering the players and Kirsty Guthrie for wearing the flags and selling the raffle tickets! The raffle took a staggering £390 (minus cost of prizes) for our selected charities The Pancreatic Research Fund and Prostate Cancer UK. Barbara Coe, Edie Douglas, Jane Monk and Jill Durrant for serving the fantastic cakes and savouries in the halfway houses. And of course we can't forget the many bakers and chefs who made such fantastic cakes and savouries. No doubt some of the visitors only come to play for the food in our halfway houses! Everyone pulled together to make the day a huge success – a brilliant team effort. We've even got some ladies coming back to our Autumn Open which is already nearly full with only a few spaces left.